You can pick your friends but for better or for worse you can’t pick your family. Take a look at some questions about your family and families in society. How often do you see your parents? How about your extended family? What is the best and worst thing about your family or extended family? How important are strong family ties to you? Are strong family ties more or less important that close friendships? Your immediate family includes your mother, father, sister, sisters, brothers, husband, wife, and children. But you might have some questions when it comes to your extended family and some complicated family relations. Let’s look at how to describe those people. Hey, Nana. How are you? I went to see my grandmother this weekend. My grandmother on my mom’s side lives in the US. My great-great-great-grandfather fought in the Civil War. In English we usually call someone “aunt” and “uncle” whether they are related by blood or by marriage. In some families, kids also call their parents’ close friends “Aunt” or “Uncle”. Your cousins are other people who you’re related to. When people talk about “cousins”, they usually mean first cousins. A first cousin is the child of your parents’ brothers or sisters. We also count other distant relatives as cousins. A second cousin is one of your parents’ cousins’ children. and a third cousin is one of your grandparents’ cousins’ children. 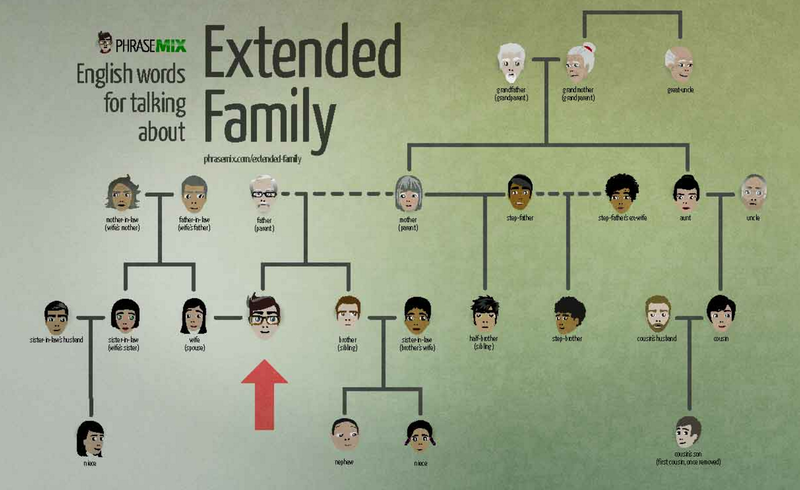 You can even talk about a “second cousin once removed”, which is a complicated relationship that many English speakers have heard of, but only a few of us understand. Your brothers and sisters are also called your siblings. The son of one of your siblings is your nephew, and the daughter of one of your siblings is your niece. My wife’s grandmother passed away last week.